UPDATED: In the space of six weeks, America nearly lost two of its finest ham curing companies. The voluntary closure of Woodlands Pork in Louisville and the tragic fire at Edwards & Sons in Surry, Va., is a profound setback to the renaissance of American cured hams. The nation’s culinary community, which has supported both and elevated their products to the highest levels, will feel the loss for years to overcome. Jay Denham, owner, Woodlands Pork. Here’s what happened and why it’s profound. In December, Woodlands Pork was voluntarily shut down by curer and co-owner Jay Denham after USDA inspectors followed up on a tip that he was packaging and selling sliced, cured meat at his facility, which isn’t licensed for such activity. Inspectors found Denham innocent of any such violation, yet they decided they didn’t like his use of struddo, a paste of oil and flour applied to his hams to help them retain moisture. So he shut the operation down voluntarily until inspectors were satisfied his processes were correct. Woodlands reopened in mid-January. 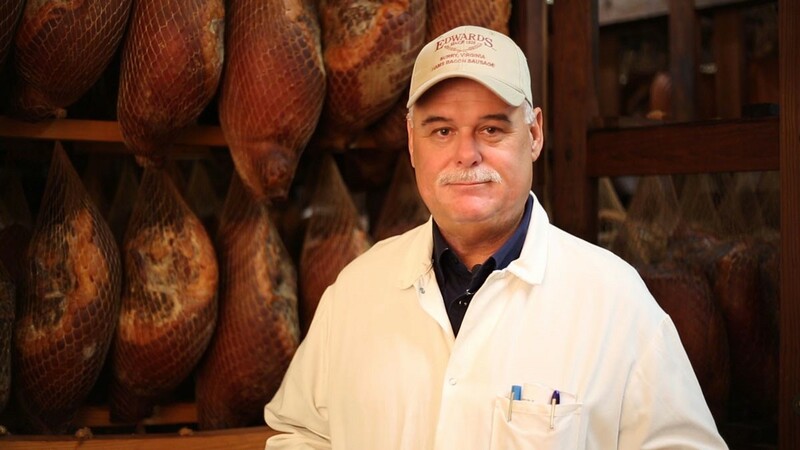 It’s worth noting that Italian prosciutto makers have applied struddo to their hams for centuries. And at least one other ham maker in the American market has done the same for many years. (No, I’m not saying who, though I’m sure his USDA inspector knows about it.) Also, Denham was trained in the ancient art of curing in Italy by an Italian master. A career chef, Denham is one of the country’s most knowledgeable European-style butchers and curers. Also, if you ask most ham curers large and small, they’ll tell you privately that USDA inspectors are legendarily ill-informed when it comes to the nuances of curing. Curers say that every time a new inspector comes aboard, they have to teach the inspector about the finer points of their long-practiced craft, while the inspector typically tells them what they’re doing is wrong or dangerous. To the Edwards fire: On Jan. 19, the 90-year-old ham curing operation at Edwards was destroyed in a tragic blaze. Seen in pictures here, the conflagration consumed the company’s iconic structures, but thankfully no one was injured in the blaze. 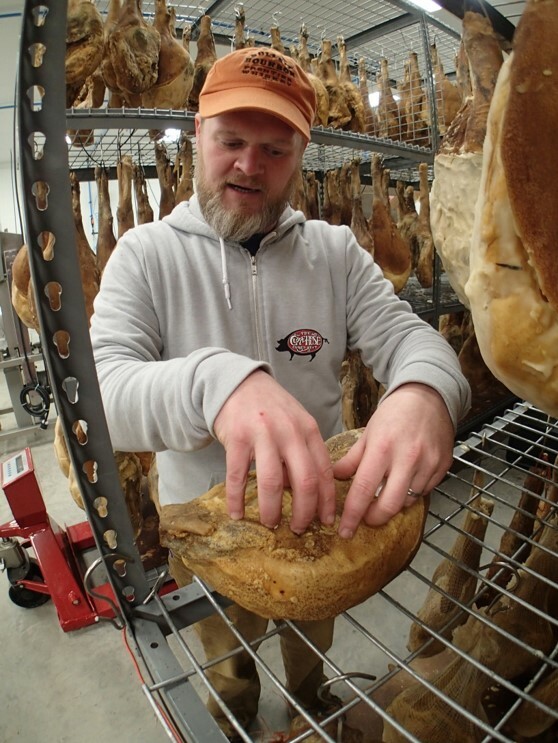 Edwards produces about 50,000 hams per year, and its Surryano ham is regarded among the nation’s best. It also produces excellent sausages and bacon. I’ve interviewed Edwards owner Sam Edwards and Denham multiple times for my book, Country Ham: A Southern Tradition of Hogs, Salt & Smoke, and other related articles. You’d be hard pressed to find friendlier men who are more passionate about their world class products. My own opinion is Denham’s Mountain Ham and Edwards’ Surryano ham are on par with the world’s finest Iberico and prosciutto hams I’ve tasted and they cost far less. Denham, probably the America ham industry’s smallest producer at 300 hams per year, is now in a position of reviving his business. He has product on hand, but not in slightly reduced quantities than he did before the USDA inspection. Sam Edwards, owner, Edwards & Sons. Edwards will have to rebuild his entire operation before he can begin curing hams again, which will be no small feat. That operation’s hams are cured for one year to 20 months, meaning it could be at least three years before we see another Edwards Surryano. Plus, whether Edwards’ hams will ever taste the same again is a serious question. Old aging houses like Edwards have their own unique molds, which actually flavor cured meat, yet those facilities and their mold is gone. Those structures also were likely grandfathered and not held to more modern USDA standards. So when Edwards rebuilds, how will those new facilities affect the flavor of those hams? Here’s another problem: The supply of long aged American hams is at least five time as tight as before. Curers such as Col. Bill Newsom’s Aged Kentucky Country Hams, Benton’s Smoky Mountain Country Hams and The Hamery have lean supplies that are likely committed to customers. There are no long-cured ham reserves in the U.S., and you cannot rush curing. Sorry to be the bearer of this bad news, but this is the reality ham fans face today. Yet that’s nothing compared to what Edwards and Denham have on their plates right now.